MANILA, Philippines - Valentine's Day is getting closer and Japanese women have picked K-pop groups they want to gift with chocolates on the red-letter occasion. A total of 1,000 respondents were asked by MPost, a Japanese site that is devoted to the Korean Wave, to answer a survey about Valentine's Day. 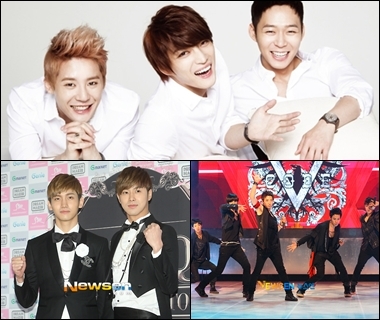 Sweeping the poll is boy band JYJ, composed of Jaejoong, Yoochun and Junsu, which received 716 votes or 71.6 percent. The group is followed by Code-V with 167 votes or 16.7 percent, TVXQ with 52 votes or 5.2 percent, Supernova with 39 votes or 3.9 percent and Super Junior with 25 votes or 2.5 percent. Following them are CN Blue with 17 votes (1.7 percent), 2PM with 17 votes (1.7 percent), SHINee with 16 votes (1.6 percent), FT Island with 14 (1.4 percent), Infinite with 14 (1.4 percent), N-Sonic with 12 (1.2 percent), EXO and SS501 with 11 votes each (1.1 percent), Big Bang and B1A4 with 10 (1 percent), MBLAQ with 8 (0.8 percent), BEAST and U-Kiss with 7 votes (0.7 percent), Shinhwa and Boyfriend with 6 (0.6 percent), Nu'est with 5 (0.5 percent), ZE:A and SMASH with 4 (0.4 percent), 2AM with 3 (0.3 percent) and BAP with 2 (0.2 percent). JYJ was voted No. 1 in all age groups, getting 38.6 percent among teens, 62.7 percent among those in their 20s, 60.5 percent from respondents in their 30s, 80.3 percent from respondents in their 40s, 86.5 percent from respondents in their 50s and 100 percent from respondents in their 60s. When it came to individual Korean artists that the respondents wanted to give chocolates on Valentine's Day, the three members of JYJ copped the first three places. Jaejoong ranked first with 342 votes (34.2 percent), followed by Junu with 173 (17.3 percent), Yoochun with 172 votes (17.2 percent) and actor Kwon Sangwoo with 55 votes. Also in the Top 10 are actor Kim Jae-won, Kim Hyun Joong and Supernova's Sungmo. Of the 1,000 respondents, 350 were 40 to 49 years old; 253 were 30 to 39; 170 were 50 to 59; 153 were in their 20s; 57 were teens; and 17 were 60 to 69.